Here are some more apps that might help you out! Camera MX is one of several gif creator apps that are also camera apps. You can record short spurts of video or many photos. The app can turn all of that into GIFs for you. It's not great for making random ones from, say, videos on YouTube. However, it's a good way to shoot some yourself. It's also a halfway decent camera app on its own. The GIF feature goes by Live Shot in the app. It should work for basic GIF creating. Footej Camera was one of the first cameras to also do GIFs. It's also a really good camera app. It features manual camera controls, an integrated gallery app, burst shot mode, a photo histogram, and more. There is even 4K video support on many devices (with more coming). The app can also create high quality GIFs using photos or videos that you shot. Those GIFs are shareable just about everywhere. The app has a few problems here and there. However, the dev team is generally fairly communicative about fixing them. GIF Maker is one of the more popular GIF creator apps. You can cut and crop videos in your gallery to create GIFs. It can also create them using up to 200 photos. You can also add stickers, text, or edit existing GIFs. The GIFs should work on most websites afterward. You have to come up with the material to make the GIF yourself. Otherwise, this one is pretty good. It does have bugs, though. There is also a learning curve you'll have to get a handle on. Gif Me Camera is a camera app specifically for GIF making. It captures up to 14 seconds of video. You then edit it with color filters, stickers, text, and other stuff. It also supports stop motion, time lapse, and other types of shots. There is support for video-to-GIF conversions for those who have videos laying around. The free version has advertisements. It also adds a watermark to your GIF. The pro version removes both of those things. Giphy Cam is one of the newer gif creator apps. It's also from Giphy, one of the undisputed champions of the GIF format. The camera records a short segment of video. You can alter that video with tons of filters, special effects, stickers, text, and more. It also has a five-shot burst mode alongside its video mode. This is probably the best GIF/camera app hybrid. It doesn't have any camera features, but it does GIFs better than the others by a fairly wide margin. It's completely free with no in-app purchases. We have some more nifty app lists that you might want to try! Some messaging apps have a GIF creator built-in. GroupMe is one of them and there are several others. They usually can't create GIFs from nothing, though. Y take a GIF, add text, and the app will remake it for you. This is a good way to lightly customize GIFs that you already like and want to use for a specific purpose. However, those who want to create more comprehensive or complex GIFs will likely need to look elsewhere. We really like how clean GroupMe's GIF customization tool is so we recommend that one first. You can always look around your normal chat apps for this functionality as well. Motion Stills is a GIF creator app by Google. It has two modes that you can use. The first shoots a short bit of video. You can turn it into a GIF from there. The second mode allows you to shoot slow motion video. You can share your Stills as looping GIFs or as videos. It just depends on what you need. The app does have a few issues. It's a newer app, though. Those issues will likely be fixed over time. The app is free with no ads or in-app purchases. It's difficult to complain too much. Pixel Animator is technically a pixel art app. However, you can create GIFs with your artwork. The app has a decent interface. You can get in and start drawing almost immediately. The free version of the app lets you make GIFs with up to 15 total frames. The paid version removes that restriction. Perhaps its most useful feature is the ability to port the prior image in a GIF to the next image. That way you just have to make slight alterations instead of starting over from scratch. It's super useful for those who want to make their own unique GIFs. PowerDirector is one of many video editing apps with GIF support. This one just happens to be better than most of the other ones. It's a video editor app. Thus, it'll have similar features. However, two of the export formats include GIF still images and animated GIFs. This will definitely work best for turning a video into a shorter GIF. The app is free to download and play with. You may need to purchase additional features via in-app purchases. 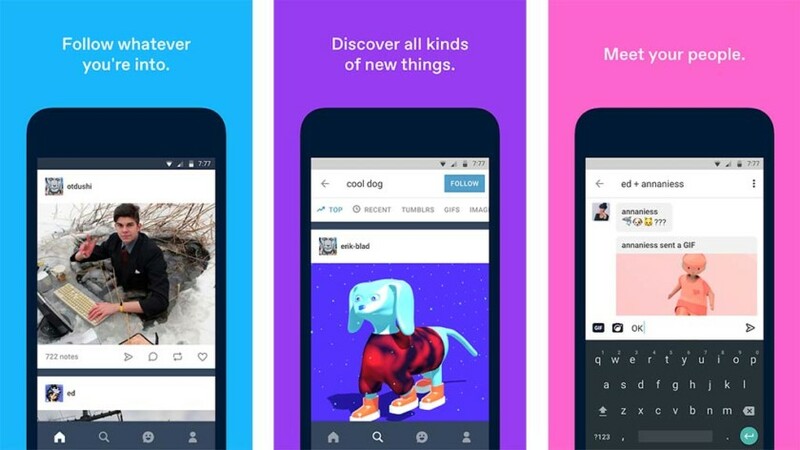 Believe it or not, Tumblr has a GIF making process within its official app. It lets you add stickers, text, and other customization if you want to. It works a lot like GroupMe's functionality does. Of course, that is on top of the app's normal function, which is to share and read stuff to and from other Tumblr users. This is a good tool for those who already use Tumblr. However, those who don't should probably try one of the other apps on this list. As usual, the Tumblr app is free with no in-app purchases. The downside is that adult-oriented content and NSFW content are now banned in the app. You will need to find a new GIF creator if you wanted to make something naughty.